Loads to say! There seems to be plenty going on in my life at the moment, both inside the bug room and outside in my ‘other life’. It’s not fair that none of my family share my enthusiasm, I know loads of couples who both love bugs. Mind you I don’t share my hubby’s interests either! As I write this he is whizzing around the mountains in Spain and Portugal on his motorbike as he does every year with his friends. Sounds like torture to me. My neighbour has organised a charity event for next week in aid of Rennie Grove cancer care. I had volunteered to take my snakes and bugs along and charge everyone £1.00 to hold them but my friend’s husband gently pointed out that most women don’t like snakes and that I might frighten people away. I thought it was a great idea but at least now I can just enjoy the day and perhaps help with the washing up etc. It really has been up and down in the bug room lately. I would love to say that everything is going swimmingly BUT, even with my best efforts all the beautiful Rainbow Pill millipedes are now dead. I have learnt my lesson, as soon as I put a photo on Facebook I was bombarded by people telling me that they are impossible to keep and I realised immediately that I had made a huge and expensive mistake in buying them. They simply died one after the other and although they appeared to nibble at the wood, moss and leaves that I provided, it was obvious all was not well. The poor little things looked stunning but they were far too light in weight and were not producing hardly any droppings. They were destined to starve to death and there was nothing I could do for them. It is the same with the Rainbow Frog beetles that are so often imported in the spring. They are beautiful beyond belief but they eat a special vine that cannot be found in this country and I now gather that the food requirements of the Pill millipedes are a similar story. However! 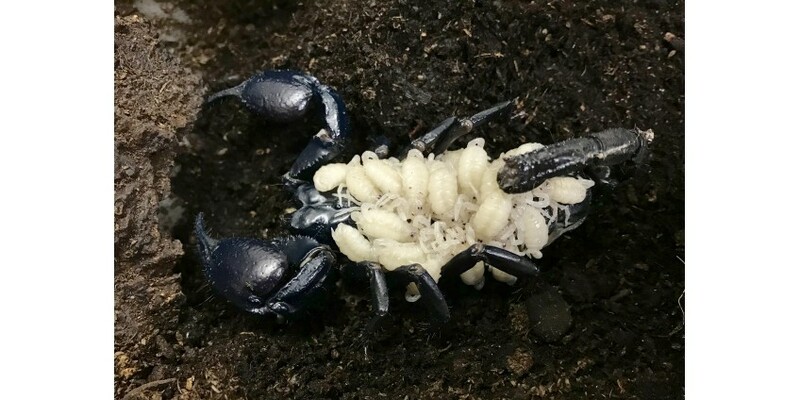 I did discover that one of my huge Black Asian scorpions has given birth to a brood of lovely little, white babies which are now clinging to their mum’s back and I have several pretty Blue tarantulas that have recently moulted. I fed all the spiders on Wednesday and thought how beautiful some of them look. I do like blue tarantulas and when I get the time I will put some photos on my Facebook page (have to take the photos first though J). Also, my gorgeous female Jungle Nymph stick insect and Giant Malaysian Leaf insect both fell down whilst going through their final moult. This is always a tricky time for such large and intricate creatures but I was so disappointed! The Jungle Nymph has now passed away but I’m hoping the Leaf insect will survive even though she has a very disfigured back leg and rather wonky wings. I was also disappointed to discover that one of my huge Haitian Brown spiders had discarded her egg sac but the other female is carrying around a very large, healthy looking egg sac and fingers crossed for my Indian Violet tarantula egg sac that is due to hatch at any minute. I’m going away with my mother in-law for ten days next month so I am already preparing things in my bug room. Yes, the rest of the family will be here but all they can do is follow my care instructions. I certainly wouldn’t expect (or allow) them to feed any of my large collection of arachnids and I feel that I really need to cut down on my stick insect collection. I know I keep talking about it but I love them so it is really hard to do but do it I must. They are far too much work for very little profit. Sadly, I spend hours collecting their food plants but I sell so few that it clearly isn’t viable as part of my business. I will keep the Jungle Nymphs, Leaf insects and just a few others but the more common species must go. Even writing this I’m panicking but I know it makes sense. I absolutely have to change the way I work. I cannot keep going the way I am. I never get time to relax at home, it seems to be all work these days. The only time I relax is when I’m out of the house and that really isn’t fair on my family, especially my husband who works very hard in his own job. He gets pretty fed up coming in to find I have a list of jobs waiting for him that are to do with my work. I am trying hard with the Ginny’s Jungle side of things and hope that in time this will allow me to cut down on the number of animals I keep. I have this week asked my website guy to raise the minimum spend on my website to £20, rather than £15. I am going to trial this for a month initially and see how things go. I just feel that I cannot justify the time it takes me to pack such small orders. Some of these orders bring in very little profit if they are animals that I have purchased, rather than bred myself. Any feedback would be good to hear, I don’t want to upset anyone but I think I need to see how it goes. I am delighted with the delivery. The millipedes arrived healthy. Ordered only two and got extra which is a nice surprise. Will definitely return for more. Absolutely beautiful Mexican red knee tarantula, it arrived super quick. She is currently exploring the new viv, thank you I'll definitely be using u again. My first order from Virginia and couldn't be happier! All of these gorgeous little millies arrived safe and sound. The tub I received was well filled with a variety of life stages and came well packaged too. I am always more than happy with my Virginia Cheeseman orders - they are the standard to which I hold all other invertebrate orders. I took a trip over to meet Virginia Cheeseman and her Tarantulas and I'm so glad I did. What a perfect little creature my new Red Knee is, I hope I have him/her for many years to come. Virginia looks after everything with the greatest care, can't recommend her enough. I had ordered from Virginia over 10 years when I first became an enthusiast ordering both Tarantulas and Scorpions and was never disappointed with the service or health of the creatures. I have recently reignited my passion and so pleased that nothing has changed in those 10 years! This little beauty arrived this morning and is in beautiful shape! I look forward to continuing my collection in the future! Speeding up – as usual running out of time! I am never completely satisfied with the substrate that I use and I’m always trying different types or different mixes. I think peat is my preferred choice but it is increasingly difficult to get hold of and it is very messy, I don’t like coir because once it is dampened down it always produces fungus but it is easy to store as it comes in neat, died packs. Sand looks nice, especially the different colours but it is just too heavy. I am once again trying vermiculite, it is lightweight, clean and looks ascetically pleasing but I do find it sticks to things, especially tarantula’s feet and I wouldn’t use it for snails as it gets taken into their body when they retreat into their shell. Anyway, I have bought a few bags from Wilko and will see how I get on. If I don’t like it I will use it in the garden so nothing is lost. Lastly for this week, I’m really sorry to any customers in Manchester who might want to call me but I am very reluctant to answer calls on my mobile with a 0161 prefix. Almost all calls from this number turn out to be junk calls from a call centre. I block them when I receive them, it is very odd. I did a quick Google search because I don’t believe these numbers are truly from Manchester, this came up straight away “Fake Number's Manchester phone numbers are recommended for drama use, such as those involving TV shows and radio entertainment”. Why? I have no idea, do you know? Super Simon, my website guy, is still looking into finding a way to make my website and blog compatible with using emojis but he says it is looking unlikely (crying face emoji here). He is still working on the new privacy laws that came in recently so I will badger him again when he has finished!